Why doesn't the extension light up? This means the extension is installed but is not active. 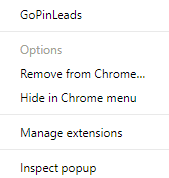 The extension will only become active and blue if you are currently using Google Chrome to browse your search criteria using either Google Maps or Google Search. You will be required to enter search criteria such as " IT Companies near London" to gain results within the extension.